The Keurig B40 offers the utmost convenience at a low price. This little coffee maker produces a perfect cup of coffee or tea just at the touch of a button. While there are other one cup coffee makers, this machine will meet and exceed your expectations in both quality and affordability. The stylish design of this machine compliments any décor and takes up little counter space. You can even use your favorite cup to brew your coffee into and then walk out the door to work or play. 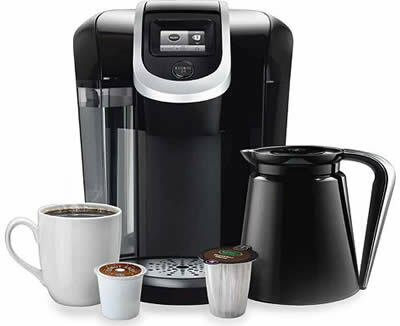 What does the Keurig B40 coffee brewer offer its users? The B40 is ready to brew within three minutes. This neat little machine offers two choices for your coffee cup, eight and ten ounces. Brews a cup of coffee within seconds. No longer will you have to try and maneuver around the counter trying to pour the water in. This is a really a useful feature if you have hard water. This single cup brewer will let you know if it’s time for this type of cleaning. A water heating and refill tank indicator light are both on the front of the machine. The B40 offers stylish design and single cup serving, fantastic for the coffee connoisseur who wants a fresh cup of coffee each and every time. With only a three minute wait for the water to heat and a few seconds to brew, its perfect for the person who is always on the go. Like other Keurig brewers, the B40 uses K-cups. There are hundreds of K-cups available and will guarantee a fresh, perfectly brewed cup of coffee. You can find your favorite brands of coffee, such as Caribou, Deidrich, Green Mountain, and Newman’s. If that’s not enough you will also find all the flavors that people are so passionate about, like hazelnut, French vanilla, and almost every strength of coffee imaginable. You will also have a great choice for tea and cocoa as well. Even if tea and cocoa are not your favorites, imagine having the option to serve your guests that perfect cup of brewed tea or a steaming cup of hot cocoa. There are numerous K-cups available in different tea flavors and cocoas. You’ll be surprised at the versatility of the Keurig B40. There are many different cocoa brands, such as Ghirardelli’s and Timothy’s. Teas are available from Twinings and Celestial Seasonings. You are sure to find one or two that will become your favorite. This machine is terrific for those people who want quality, but at an affordable price. It offers a wide array of features and it is versatile enough for coffee, tea, and cocoa. Clean up is a snap, with a removable drip tray. Normally priced under $100 or so, the Keurig B40 is a great bargain for a machine that will give you years of quality coffee.